We're looking for new ways to share information, examples and stories about Carr China with you. Please take a moment to tell us a little bit about yourself, you collection and how we can shape this site to meet your Carr China collecting needs. 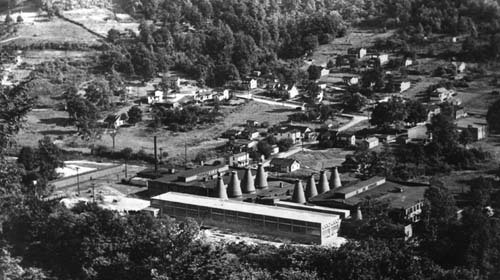 The Carr China Company was nestled along the bank of the Tygart River in Grafton, WV. Founded by Thomas Carr in 1916, the factory made vitrified commercial china, fine-medium gauge hotelware and some residential service pieces. The factory operated from 1916 until July, 1952 and subsequently burned on July 16-17, 1966. The right to privacy is one we absolutely defend and protect. Please know that we will NEVER share your name, address or information with anyone without your permission...ever! We don't like SPAM any more than you do! Zip Code Note: Providing your zip code helps us determine where collectors live to plan future events. How long have you been collecting Carr China? How many different PIECES do you estimate are in your collection? How many different PATTERNS do you estimate are in your collection? Have an unusual Carr China relic? Share it with us! If you would like to share your favorite piece of pottery, memorabilia or other Carr-related items with your fellow collectors, please send us a clear digital photograph showing your item in a close-up shot. Include your name and the information about the item you would like to share. Please limit your image file size to 260K. DID YOU KNOW? 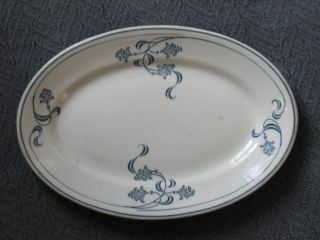 This oval platter is in Carr's Ellwood pattern. It was largely distributed by the Ford Hotel and Restaurant Supply Company of Saint Louis and is often found with the backstamp of "Ford, St. Louis" and marked Carr China Company, Grafton, W. VA. It isn't unusual to see this referred to as the "Ford" pattern, but Ford was the distributor and the pattern is named of Ellwood. The pattern name can be found on pieces that do not bear the Ford logo and is typically in the cursive script frequently used by Carr.